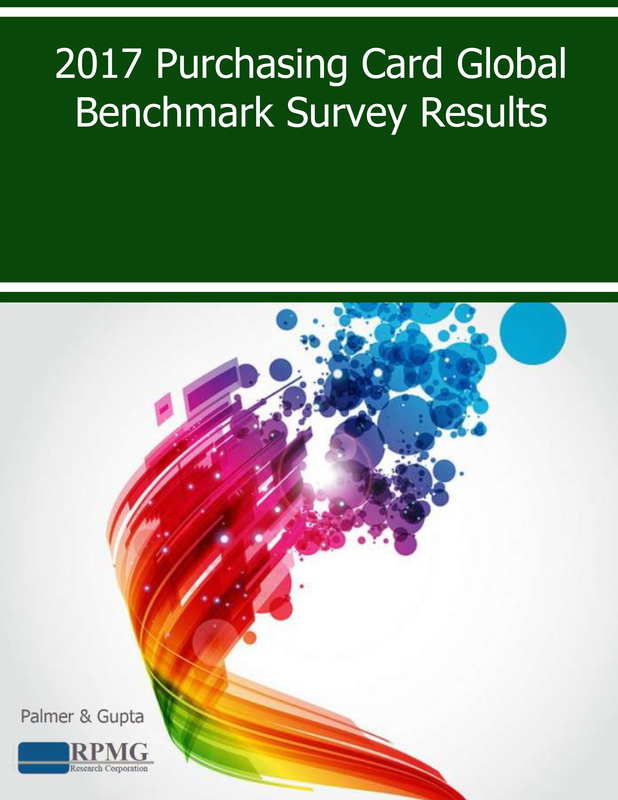 2017 Purchasing Card Global Benchmark Survey Results (based on responses outside of North America) The 2017 Purchasing Card Global Benchmark Survey Results (the “Report”) is RPMG Research Corporation’s inaugural edition of the Purchasing Card series for organisations located outside of the United States and Canada. The report analyses the responses of card users from eleven different card issuers regarding purchasing card value, spending patterns, growth potential, supplier acceptance, and card misuse. Additionally, where applicable comparisons to U.S. and Canadian card programmes are made to highlight the cultural and organisational differences among global programmes. Key topics discussed in the global report are summarised below. Global respondents rate the level of value attained from purchasing cards across a variety of financial and process-improvement measures, including simplifying the purchasing process; increasing procurement efficiency; reducing the number of petty cash accounts and cash advances; reducing labor costs associated with processing transactions; improving working capital/cash flow; and improving spend transparency. The value attained from purchasing cards is largely driven by the actions of management in the categories of acceptance, control, and (use of) technology. The Report analyses major benefits of card use (transaction cost savings, increased working capital, process simplification, and procurement cycle time savings) from the global card programme perspective. Average purchasing card programme benchmark statistics are provided to assess the level of p-card use in regions outside of the U.S. and Canada. Data points discussed include monthly spending per organisation, per employee, per card, and per transaction; monthly transactions per card, the card-to-employee ratio, and the percentage of transactions of differing amounts paid by purchasing cards. The benchmarks are also provided for specific global segments including (a) Europe and the United Kingdom, and (b) Asia and the Asia-Pacific region. Global respondents estimate the expected growth of conventional p-card spending (plastic, ghost, and cardless accounts) through 2021. Furthermore, based on current capture and penetration of spending with purchasing cards, global programmes have significant growth potential. The current state of supplier enablement is assessed for global card programmes, as well as the impact proactive actions have on card acceptance and purchasing card value. The level of card misuse (policy violations, fraud, and misrepresented business spending) among global card programmes is assessed. The data shows the prevalence of card misuse to be very low, and its impact to be financially insignificant compared to the cost savings and benefits derived from p-card use.